Elizabeth's jewelry lends itself to today's lifestyle by offering clean, sophisticated designs which move easily from casual to work to dress. Elizabeth is drawn to forms which have a simple yet elegant look and a contemporary style to them. 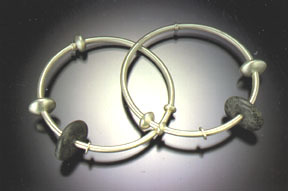 Many of her pieces incorporate beach stones which she gathers from beaches in Maine. Her jewelry can be found at fine juried craft shows in the Northeastern U.S., as well as at galleries and shops throughout the country. All of her work is made entirely by hand, beginning with flat sheet and wire which is transformed through sawing, forging, and soldering into classic, timeless pieces of jewelry. Each piece is signed by the artist and is individually hand-crafted with care to high standards at her studio in the coastal town of Kittery, Maine. Custom work and wholesale inquiries are welcome. A catalog is available on request. Elizabeth grew up in Pennsylvania and received a BFA in Jewelry & Metalsmithing from Syracuse University School of Art in 1975. Upon moving to Maine in 1977 she began teaching art in public schools. She served as Co-President of the Maine Art Education Association for four years in the mid-1980's and pursued graduate studies at Massachusetts College of Art. In 1988 she taught for a year at a high school in Scotland through the Fullbright Teacher Exchange Program. 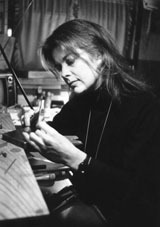 In 1989 Elizabeth turned to metalsmithing full-time to design and produce her line of jewelry in gold and silver.